The smiling man said his name was Jake and, in my jet-lagged mind, that was enough. I followed him out of the Incheon Airport to a minivan, threw my bag in and sank back against the seat. Following the advice of a friend, I was moving to South Korea to teach English for a year or two to pay off my student loans. Little did I know that I had just stepped into a taxi—and had taken the first step toward a completely different life. As a fresh university graduate, with a shiny and purportedly useless degree in English, I didn’t have any definite plans for my future. Born and raised in rural Wisconsin, I expected a storybook life: remaining close to home, finding a decent job, getting married and buying a house. A semester abroad in Scotland had sparked a love of travel, but I never imagined settling overseas. His confusing answers took a turn for the worse when he asked me a question of his own: “Where should I go?” That’s when it dawned on me. It was almost midnight, and I was sitting in a taxi with someone who was just as clueless as I was. Neither of us had any idea of where we were going. My thoughts racing, I remembered that the real Jake, the director of the school, had sent an email with his contact information, and the now-revealed taxi driver drove through the streets until finding an neon-illuminated internet cafe. Tracking down the email, I borrowed a phone and reached a very concerned Jake, who arranged to meet the taxi near the expressway. Waiting on the side of the road, bag in hand, I watched the two of them talk through glazed eyes until Jake turned to me with an apologetic smile. “He says that you have to pay him a hundred dollars.” Numb and too exhausted to argue, I pulled out a crisp bill and handed it over. One hundred dollars gone in the blink of an eye. As we drove to my small apartment, I debated in my mind. Was I really that unprepared for living alone in a completely alien country? Should I just book a flight back home in the morning? A rough introduction to life in Asia soon turned into an unexpectedly enjoyable experience. 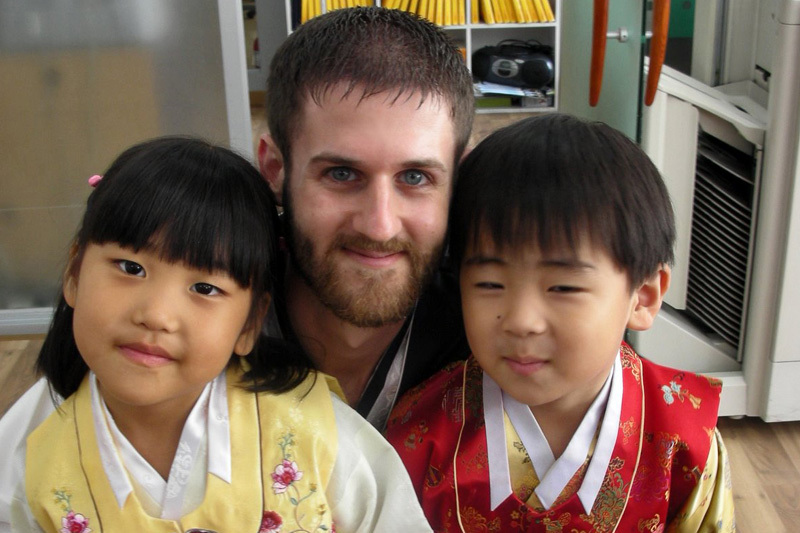 Being at the front of a classroom felt natural, and rather than return home after my loans were paid off in full, I stayed and opened a school of my own with a Korean partner. I never looked back. The risks that came after never quite felt as daunting as those first long hours in South Korea. Traveling alone around the world, moving to Thailand with no plans, turning in my resignation without a new position lined up. Every risky decision since has brought the greatest rewards, and life in Asia has fundamentally transformed that young boy from Wisconsin. Many of those I grew up with remain in my small town. Some have moved farther afield, finding work and starting families in other states. Though I still hold memories of living that life, it’s no longer me. My road has been filled with unexpected turns, and the most rewarding experiences in my life have come from embracing them. Taking a risk in your career or life can be frightening, and you may lose something in the process. But in my experience, the risks have led to a far richer life.